The Mayor of London’s 10-minute New Year's fireworks display is centred on the London Eye but attracts huge crowds along the banks of the River Thames (see map). Since 2014, ticketing has been introduced for the best spots due to the popularity of the fireworks display. The last batch of tickets are released on 2nd December - details of how to get tickets here. You can book four tickets maximum at a time. As in previous years, there will be live music to keep the crowds entertained leading up to the famous Big Ben ‘bongs’ and the launch of the UK’s biggest fireworks display, accompanied by a tailor-made soundtrack. 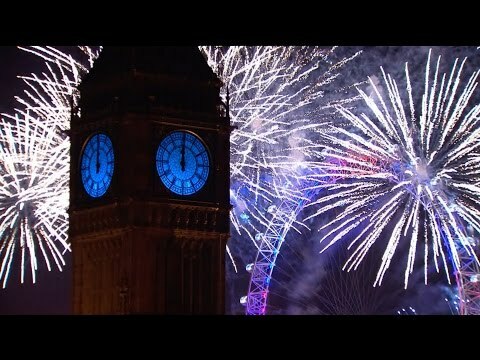 (As well as 2016 video above, the 2012 fireworks display - see video clip - was particularly spectacular as it marked the start of the year of the London Olympic Games). Following the turn of midnight and joining of hands to sing Auld Lang Syne, there will be DJ music until around 12.45. BLUE AREA tickets cover the stretch of the Embankment from Westminster Bridge to Embankment Tube station. You must access this from the north side of the river (the side opposite the Coca-Cola London Eye). Entry is allowed from 8pm to 10:30pm. RED AREA tickets cover the stretch of the Embankment from Embankment Tube station to Temple Tube Station. This can only be accessed from the north side of the Thames (the side opposite the Coca-Cola London Eye). Entry is allowed from 8pm to 10:30pm. WHITE AREA tickets provide access to Westminster Bridge. This can only be reached via the south side of the river. Entry is allowed from 8pm to 10:30pm. GREEN AREA tickets cover the area behind the Coca-Cola London Eye. This can only be reached via the south side of the river. Entry is allowed from 8pm to 10:30pm. PINK AREA tickets cover Waterloo Bridge, accessed only from the south side of the river. Entry allowed from 8:30 to 10:30pm. A signed walk route (7.1km / 4.4 miles) will be in place around the viewing areas which all close at 11.30pm. Due to large crowds, allow extra time for walking - it can take much longer than usual. The display, and the Eye will be live on BBC One from 11.55pm. Alcohol, food and drink will not be on sale at the event. If bringing your own booze put it in plastic bottles (don't bring cans or glass). The full fireworks show will be broadcast live on BBC1. This year, the fireworks will not be screened in Trafalgar Square or Parliament Square. Travel on Transport for London services is free from 11.45pm until 4.30am.